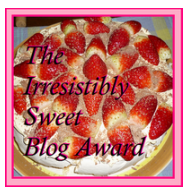 Donna K. Weaver has awarded me The Irresistibly Sweet Blog Award. It is funny because I've seen this award splattered on other blogs but I've only glanced at the picture it comes with. This is the first time I've realized that it is NOT a pepperoni pizza. So with that, and being tagged, I've got some questions to answer. Again. This will probably be the last time I do this. While I do enjoy putting these lists together I really don't want this blog to turn into stuff about me. I use Facebook and Twitter for that purpose and I'm more than happy to friend and follow writers with common interests. I also love reading others when they do this, so I would encourage others to not follow in my path. I thank you for your understanding. 1. Copy and paste the award to your blog. 2. Thank and link to the person(s) who nominated you. Oh boy. This will probably be harder than finding 8 people to tag in my previous question/answer blog. I love Peanut Butter and Jelly Sandwiches. Not only are they easy to make, but they are delicious. I can eat them for any meal. In all seriousness, if you took the number of days I've been alive, doubled that number, you would probably have a good approximation of how many I've had in my lifetime. It amazes me of how many people have memories of me and PBJs. I'm surprised I have not turned into one since you are what you eat. In case you are wondering: wheat bread, Jiff Extra Crunchy Peanut Butter, and Seeded Red Raspberry Jelly. A glass of milk on the side to wash it down is a bonus. Do I have you on the edge of your seat, yet? I love to cook! Especially things with sugar or peanut butter in them. I love movies!! And now that I'm writing I call it something else: research. I'm a gadget maniac. If it is shiny, makes noises, and has an operating system I am 10000% more likely to buy it. I'm going on vacation in a couple of days. I can't wait! I have claustrophobia. I get uncomfortable in elevators. I get more uncomfortable if others are in it with me. Anything smaller than that and I'm not a happy camper. If I read about somebody in a confined area I need to go outside. I don't have a lot of other fears. I used to be afraid of heights, but I outgrew that. I guess I have an irrational fear of being handcuffed to the bottom of a pool or being buried alive in a coffin but I think they both stem from the claustrophobia and watching too many movies. I've had to re-write my seventh random fact four times. I think I'll just stick with this one. You make me smile, James. Seriously. Pepperoni pizza? That such a guy thing! Hmm. So I guess you like PB&J, eh James? :D I love them too. One of my sons can't stand them and I just don't get that! What's not to love? And I LOL at your movies=research. I couldn't agree more! And James, just because you're my friend, I hope that you are never handcuffed to the bottom of a pool! "I hope that you are never handcuffed to the bottom of a pool!" That is the nicest thing anyone has ever said to me!